Good one! we should all just be able to leave things, and move on. 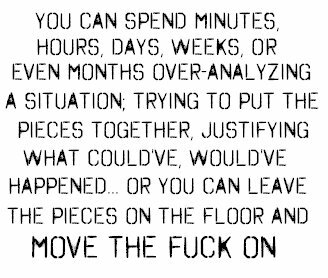 WOuld be better than to waste so much time on overanalyzing things and stuff! i love this quote, things like this seem so simple. this is one of my favorite pics. she's captivating! who is this woman? She is effing beautiful. I love this photo.